The IS 350 is a very solid, capable, and desireable luxury sedan. It enters the ultra-competitive entry-level luxury sport sedan segment with typical Lexus strengths boasting style and class in spades, a high degree of technowizardry, and acceleration power advanced to a new class. On paper, it may perhaps be the best in terms of performance, quality, and luxury. However, it may not be the first choice for you serious driving enthusiasts. See also the main fact sheets for the Lexus IS. Its interior quality, luxury design, advanced safety and performance technology, and strong fuel economy positions it near the top of its class. It is arguably the most advanced, refined, and confident sport sedan under $40,000 today.Lexus IS has the most advanced electronics among all the German competitors. Buyers of the IS 350 will have to be satisfied with a six-speed automatic transmission and cramped rear seat space.The Lexus IS also do not offer the same driving experience as its German competitors. The 2006 IS is offered with either a 2.5 or 3.5 liter V6 engine and rear wheel drive. It's rated at an impressive 306 hp at 6,400 rpm. Once again, you can expect the Lexus mark of excellence utilizing technology. The IS 350 gets a more performance-oriented version of VDIM (Vehicle Dynamics Integrated Management), an integrated system that controls traction, stability, brakes, and steering. The 3.5 liter V6 will produce 0 to 60mph in the low-five-second range making it a top racer out of the block and quicker than the BMW's 330i by nearly a second. For those who prefer a sports car feel, it may be a bit disppointing. Many agree that the thrust of the engine itself somehow seems muted and that the upshot of the technowizardry almost produces an antiseptic feeling at the higher speeds. It's great with speed, it sticks its corners, and it stops with authority. 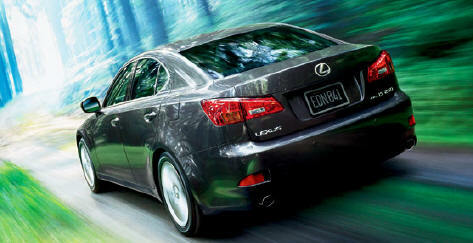 According to FuelEconomy.gov, the Lexus IS 350 gets 21mpg in the city and 28mpg on the highway. These numbers earn it a 16th place slot in Autos.com's Near-Luxury Car category for fuel efficiency. The Lexus IS 350 offers a comprehensive array of passive and active safety equipment. It received an Insurance Institute for Highway Safety (IIHS) rating of Top Safety Pick 2006 Silver.In a 40 mph frontal offset crash test, it ranked good across all injury categories. It earned good side ratings plus an acceptable rating for rear crash protection. Standard offerings includes front and rear side curtain airbags and front seat-mounted side airbags. It is a standout in accident avoidance. The Vehicle Dynamics Integrated Management (VDIM) system further refines vehicle control by tying together traction control, antilock brakes with brake assist, and the Vehicle Stability Control system. Optional is a Pre-Collision System (PCS) with a front mounted radar sensor. When the system's computer determines that a frontal collision is unavoidable, it preemptively tightens the front seatbelts and preps the Brake Assist for increased braking force. Although the new IS 350 is too new to provide any accurate reliability information, its predecessor, the IS 300, which was produced from 2001 to 2005, had high ratings in this department. Though it suffered from some minor engine problems in its debut year, these were quickly corrected, and the IS 300 continued on with an impeccable maintenance record. Knowing the reputation Lexus has come to be known for, the IS 350 will, in all likelihood, be just as reliable. It shows off a roomy, luxurious yet sporty cabin. Everything from the soft-touch dash and door panels to the supple leather seats exudes high quality. Interior feature highlights include: a 13-speaker premium audio system with an in-dash, six-disc CD changer and an auxiliary input for iPods or MP3 players; a high-tech climate-control system that includes a dust and pollen microfilter; humidity and smog sensors; heated and ventilated front seats; steering wheel audio controls and Optitron gauges with personalized shift and speed settings; and, Keyless Smart Entry and push-button starting. However, rear seating isn't as palatial. One would assume with the larger dimensions it would have more more rear seat room. Not so for you leggy riders. There seem to be no complaints on the Lexus IS exterior. The car is wider, a bit longer, and more substantial looking than the model it replaces. It's style is very much in line with the new, more expensive GS. Lexus calls this design theme "L-Finesse," a philosophy with three fundamental elements: purity, elegance, and anticipation. The Lexus IS sedan comes in six different trim levels. The standard features list includes keyless entry and ignition, tilt and telescoping steering wheel, power doors and windows, leather seating, cruise control, an auto-dimming rearview mirror, a moonroof and a 13-speaker premium audio system with an in-dash six-disc CD changer. Options include a 14-speaker Mark Levinson audio system, 18-inch wheels, 10-way power seats, a navigation system, Dynamic Radar Cruise Control (which allows drivers to set a preferred interval between the IS and traffic ahead), rear park assist, rain-sensing wipers, corner-adaptive headlamps, Bluetooth connectivity and bi-HID headlights. This page was last edited on 14 June 2010, at 07:37.